Shortly after arriving in Napa in 2006, Randy began his winemaking journey at Cakebread Cellars. 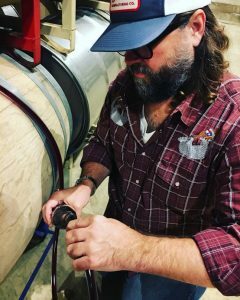 Recognizing the need for both experience and education, that first summer he also started taking classes in enology and viticulture. He continues to hone his enological skills and viticulture practices to the present. Randy has also had the good fortune to work with many highly acclaimed winemakers such as Andy Erickson, Michel Rolland, Mike Hirby, and Helen Keplinger, at various distinguished producers including Colgin, Caldwell, Realm, and Marciano. Today Randy is the winemaker for Lightning Wines and manages wine production and vineyard logistics, as well as sales and marketing. Brooke is a CPA and a Texas A&M Aggie. She gained the majority of her wine business experience as the CFO of Patz & Hall Wine Company, where she worked for her first 5+ years in Napa Valley. Before being in the wine business, her background includes tax consulting for Arthur Andersen LLP and accounting and financial analysis within the oil and gas industry. Brooke handles the business side of Lightning, including accounting, finance, and compliance. If magazines wrote articles about rock star accountants, she would be a household name. The photo on our label is from artist Paul Hadley. Randy and Paul first met over a few glasses of Lightning Wines – Paul was a guest of a couple of Grenache Society members being hosted at the winery. Randy became interested in Paul’s artistry and was excited to peruse the product of Pioneertown, CA. It’s hard not to be attracted to the vitality and expression of Paul’s photos, and the Lightnings were instantly captivated. This photo of an impending storm really struck a chord on many levels and even reminded Brooke of growing up in West Texas. They knew right away that they wanted this to be the new label. Throughout the process Paul was generous with his time and his work, and continues to be supportive and encouraging with all that Lightning Wines is involved in. More of Paul’s amazing work can be found at www.paulhadley.com.